The statue of Sakyamuni Buddha is three meters(10 feet) high, and is gilded with gold leaf over a Japanese lacquer finish. In the walls, 500,000 flower petals in 2,019 cases are kept in permanent storage. The scattered flower petals are lotus blossom petals, and they are used as decorations or scattered about to extol the virtues of Sakyamuni Buddha. 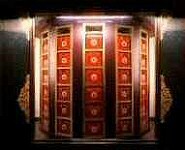 (Revolving shelves for storing of Buddhist scriptures or sutras; located underground below tower) The Buddhist scriptures or sutras copied by believers are kept in red Japanese lacquer finished boxes, and stored on shelves that are divided into 84 sections. The entire shelf assembly makes one complete revolution every 30 minutes. Aluminium plates on which the scriptures have been micro-filmed are in permanent storage.